I sat under the tree to the left of the photo and called up the coyote in the center of the frame. I have been getting quite a few questions on calling sites. Let me tell you why I like this one so well. My truck is parked on a seldom traveled dirt trail 1/4 mile from my stand. I drive in quietly and then sneak to this spot. The electronic caller is set where the coyote is now, about 20 yards from me. Prevailing winds are usually in my face and there is a huge open flat behind me. I almost always start with a softer sound like woodpecker distress or a soft call on my Critter Call Pee Wee. Calling for a minute or so and then a couple of minutes of silence and watching for those close dogs to come sneaking in. If nothing shows I go to a jackrabbit distress for a minute or two and then silence and watching for another two minutes. If bobcats might be in the area I stay and call for at least 30 minutes. 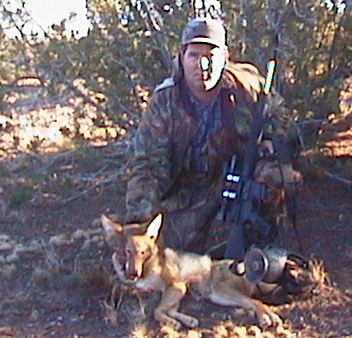 Coyotes only get 15-20 minutes. A high vantage like this and keeping the sun at my side or back gives me the visual edge. This coyote came from the small rolling hills in the center of the picture. I'm sure it utilized the open meadows for chasing rabbits and mice at night and then enjoyed the cover to bed and hunt during the day. This spot has produced numerous thrills over the years and will continue to do so for many years. I find that getting into a prime location like this undetected is where 90% of my success lies. The other 10% is good sounds, camo and the ability to shoot. Don't think there is a magic sound that will have them coming because it is new or different. Coyotes eat rabbits, mice, birds and then anything else from carrion to berries. 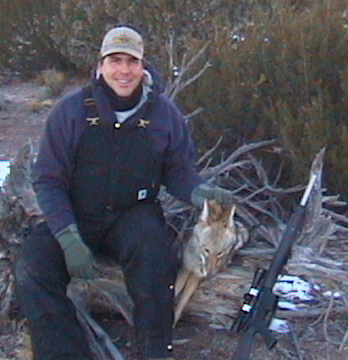 Location is the key to coyotes, bobcats and foxes.